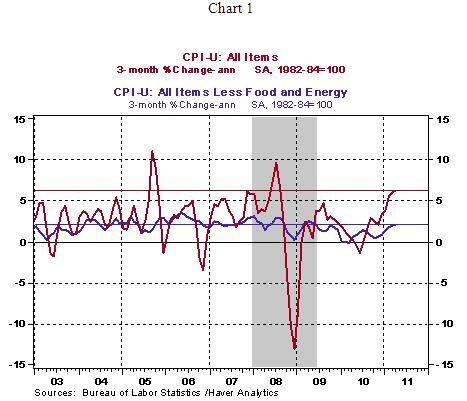 April inflation data point to an upward trend of both the all items Consumer Price Index (CPI) and the core CPI, which excludes food and energy (see Chart 1). The data suggest that in as much as the Fed views the recent gains in energy and other commodity prices as "transitory," the level of concern could change fast if the economy gathers steam. In the three-months ended April 2011, the core CPI has risen at an annual rate of 6.2%. The Fed publishes forecasts of the personal consumption expenditure (PCE) price index. 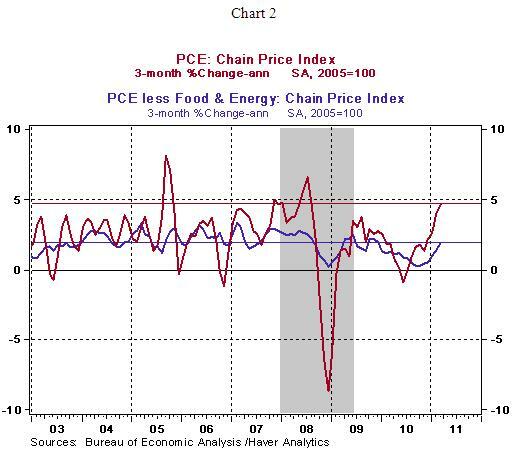 The April projection shows a 2.1% - 2.8% increase in PCE inflation and 1.3%-1.6% core PCE inflation for 2011 on a Q4-to-Q4 basis. During the three months ended March, the PCE price index had risen at an annual rate of 4.7% and the core PCE recorded a 1.9% annualized gain. The Fe's forecast implies expectations of a moderation of inflation in the months ahead. As Chairman Bernanke pointed out in the press conference, if medium term inflation expectations are "unmoored" the Fed stands ready to take appropriate action. Market expectations of inflation remain well anchored, for now. Inflation expectations, as measured by the difference between the 5-year nominal U.S. Treasury-note yield and 5-year inflation protected security, stood at 2.15%, down from a high of 2.45% on April 29 (the week of Bernanke's press conference). 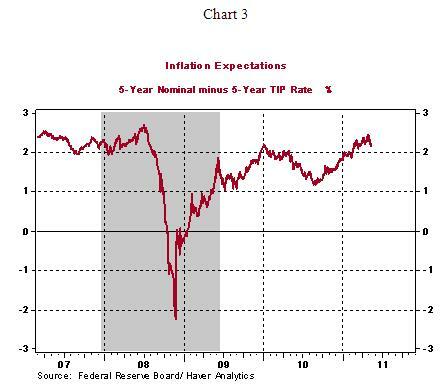 All said, actual inflation is trending up, while inflation expectations show a moderating trend. Treasury security yields have moved down in the current environment of high energy prices, a downgrading of the U.S. economic outlook, and the nation moving close to debt limit. 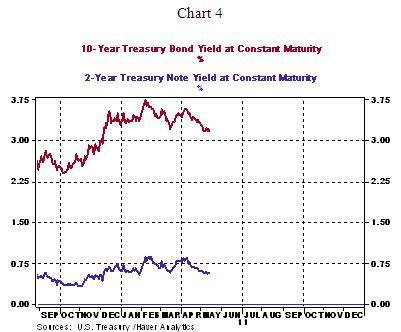 The 10-year Treasury note yield at 3.15%, as of this writing, is down from 3.75% on February 8, 2011 (see Chart 4). The downward trend of yields implies that economic conditions are not indicative of imminent inflation.